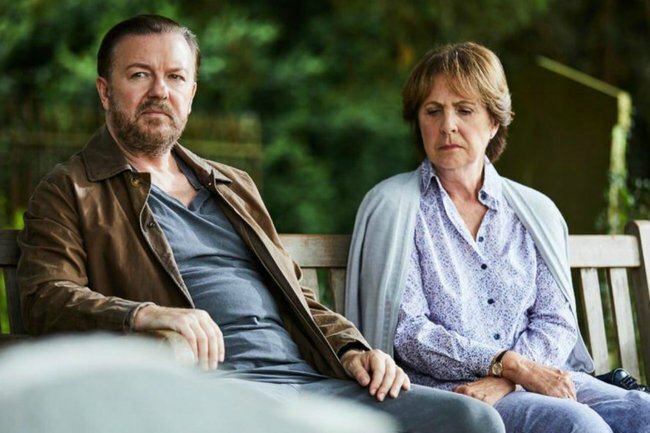 After Life Netflix review: Ricky Gervais' brilliant black comedy. A funny story of sadness: After Life is the brand new Netflix show audiences are obsessed with. This post deals with themes of self harm and suicide and may be triggering to some viewers. The word heartbreaking might be a grossly over-used term to describe anything moderately sad, but there’s no better word for Netflix’s latest series, After Life. The Ricky Gervais directed and produced six-part dark comedy series is about a suicidal widower named Tony Johnson, who is also played by Gervais. Tony is a cynical, angry and cruel man, who after losing his wife (and soulmate) Lisa, has resorted to living his life without a filter. At times he can be heartlessly and unnecessarily cruel, but it’s all redeemed by the love he had for Lisa, which we’re shown through a series of flashbacks in Lisa’s 13 Reason’s Why esque post-mortem, video message which she leaves for him. While every episode is filled with Gervais-renowned moments of sarcastic gold and comedic absurdity, they’re shared with raw, poignant and existential observations of death and grief. There’s a particular moment Tony shares with a junior journalist at the local paper, that gives a passing glimpse into the kind of anguish he’s in. The show is peppered with multiple moments like these. Tony with his late wife and their shared dog. Image: Netflix. From start to finish, After Life spans just three hours and you can, and will want to, binge the series in its entirety. Despite this, the scenes, quips and pieces of irreverent wisdoms will stick with you long after. Tony handles the passing of his wife in the least graceful way possible. He&apos;s no martyr to his grief and it&apos;s this unflinching and honest portrayal of hurt, anger and gradual hope that&apos;s resonated with audiences. Ricky&apos;s After Life breaks my heart and Mends it within seconds . Beautiful series. Have you watched After Life? What did you think of the show? Tell us in a comment below.